5	stars -	"Review for Achievement (100) CARD Certificates." 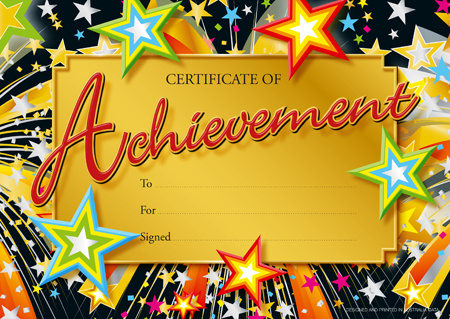 Dale Carter This Achievement (100) CARD Certificates. is the best Certificates - Card I have tried. Reward students for academic and citizenship performance. Large range of themes with bright colours. Card 350 gsm. Size 210 x 147mm. Pack of 100.